A common street food snack among locals, chá yè dàn (Chinese: 茶葉蛋) are pre-boiled eggs which have been re-boiled in tea, sauce, or spices. It is also known as the marble egg because cracks in the eggshell create marble-like patterns on the egg white. The yolk should have a thin, greyish edge with a yellow core. The use of five-spice for the brine adds a savory, slightly salty flavor to the egg white, and the tea brings out the yolk’s flavor. The eggs are served sitting in a bath of dark brine in order to continue to steep for increasing flavor. Cha ye dan has recently become an Internet phenomenon after being used as a mechanism of belittlement between Taiwanese media and Chinese mainlanders. During a well-known Taiwanese variety talk show, a woman claimed that she had visited China and noticed that locals were so poor that they couldn’t even afford tea eggs. Since then, many Chinese netizens have turned the criticism into an online joke that hyperbolizes the value in this street food. Pictures will of the tea egg will commonly be framed in a luxurious or fancy way, captioned with a mocking tone that jokes about the large amount of money it costed that individual to purchase such a small treat. Traditional preparation uses Chinese five-spice, which contains cinnamon, star anise, fennel seeds, cloves, and Szechuan peppercorns. They can be cooked in this spice-seasoned broth alone, or sitting in a brine that is also seasoned with soy sauce and black tea leaves. Eggs are first hard-boiled and removed from the water. The shell of each egg is gently cracked all around in order to create a marbling effect while brining. 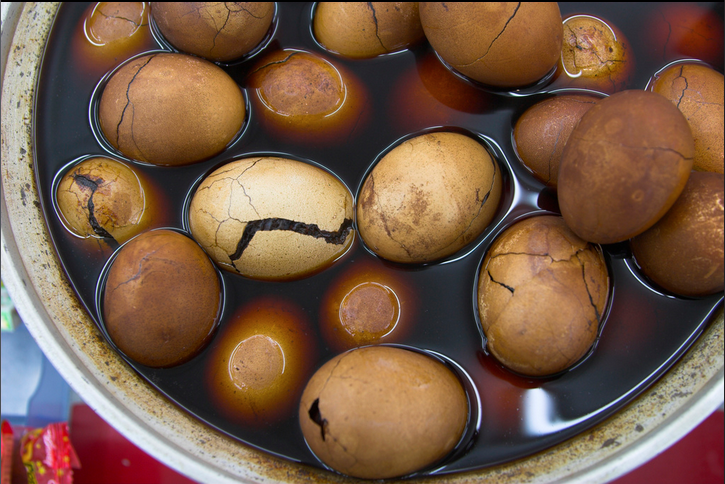 The cracked eggs are placed back into a spiced-tea broth made of Chinese five-spice, soy sauce, and black tea. The eggs simmer inside this mixture for some time and then transferred into the refrigerator to allow for further steeping. The longer the tea remains in the mixture, the more flavorful and colored it will be. Essentially of Chinese origin, the details of cha ye dan’s origins are unclear, but the street food gained popularity within a short time span. The dish was introduced to countries where Chinese population migrated in large numbers.